San Ramon pioneers started schools for their children very early. In the History of Contra Costa County (1882), it says an early San Ramon school was built in 1852 at the “foot of the eminence which is known as Cox’s hill, near the village of Limerick (San Ramon).” Other early and at-home schools are mentioned as well. Then, after one failed election in 1864, on October 27, 1866, voters supported a tax of $2000 to purchase land and erect a new school house. 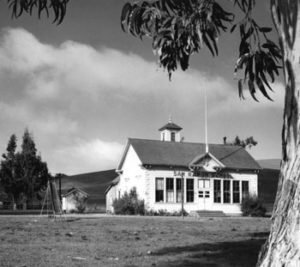 This classic and still-remembered San Ramon Grammar School was built in 1867 and served the community until 1950. Ebenizer Dole, a carpenter, built the all-wood San Ramon School. The building measured 46 X 26 feet in dimensions, had a 13-foot high ceiling and an impressive bell tower. J.D. Smith recalled one early teacher, Miss Everett from Stockton who used to read a chapter from the Bible and pray. She had some problems with the older boys and “would shed tears because of their conduct.” Albert J. Young was the first teacher at the 1867 school, teaching from 1867-1869 and 1873-1877. There was a small and a large room, with grades 1-4 in the small room, 5-8 in the large one. The San Ramon School provided schooling and a social center for the community for over eight decades. For years it provided the only space of any large size. Howard Wiedemann and Leo Lynch remembered removing the school’s central partition for parties. The building was used to celebrate May Day, have flag ceremonies, spelling bees and meetings. Viola Lynch said that all social occasions occurred there until the San Ramon Hall was built in 1911. For nearly 50 years it was the heart of the community. The school was enlarged in 1876. During the 1890s enrollments stayed around 110. In 1896 the school grounds were beautified by the San Ramon Public Hall Association. These improvements included new fence and stile on the south side; rustic seats throughout the grounds; an awning for the girls’ yard and ring and bars for the boys. After the Danville Union School District was created and a modern four-room school was built in 1922 near the San Ramon Valley High School, the San Ramon trustees discussed joining that district. In 1945 farmer Roger Schulte, an educator, and Rancher Fred Wiedemann debated the issue again. But San Ramon stayed with its own district until 1965 when all valley grammar and high school districts unified. A new school, the second, was built in 1949 and opened in 1950 with three rooms at the start. The original 1867 school building was razed in 1960. Today a San Ramon Valley Historical Society plaque marks the location, northwest of Fostoria Way on San Ramon Valley Blvd., of the long-lasting and well-loved San Ramon Grammar School. Sources: Contra Costa History Center, Museum archives, Contra Costa Gazettes in 1874, 1894 and 1896, James D. Smith letter in 1925, Valley Pioneer Centennial edition, 1958.